“As matters stand in the Muslim world today, it is the decline of religious leadership from the Islamic standard in a serious measure that constitutes a major cause of its inability with regard to its emergence from the abyss into which it has been descending since some time. The remedy for the situation is obvious.” – Fazlur Rahman Ansari, ‘The Qur’anic Foundations and Structure of Muslim Society’. Dr. Iqbal had made a significant call, in a series of public lectures delivered in the 1930’s, for the “reconstruction of religious thought in Islam”. 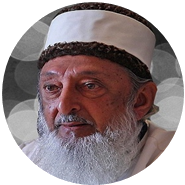 “The Qur’anic Foundations and Structure of Muslim Society” was, in part, Maulana Ansari’s PhD thesis, and it was perhaps the most outstanding contribution to Islamic scholarship by any of the students of Iqbal. It also represented a significant response to Iqbal’s call for that ‘reconstruction of religious thought’. Maulana disclosed that Iqbal was himself the spiritual guide who guided him to the methodology with which he was able to pursue a sustained study of the Qur’an. It was that study which resulted in the production of this great work. Even while he responded to Iqbal’s call, Maulana did not agree that Islamic religious thought was so defective that it had to be reconstructed, and he attempted no such thing in this, his magnum opus. His view was that Islam had to be rearticulated in the context of the awesome challenges posed by the modern thought that originated from modern western civilisation. The world of religion, in general, and the Muslim world in particular, was subjected to cleverly formulated attacks on its integrity, and it was mainly because the scholars of Islam had so far failed to respond authentically and appropriately to those attacks that Muslim society was in a state of confusion, dangerous decline and disarray. Maulana commenced his book by identifying the forces that were responsible for the attacks. A Christian-Jewish alliance was waging an evil campaign of villification against Islam. He quoted extensively from Jewish and Christian scholars who were vilifying Islam, and in so doing identified a mysterious and sinister Euro-Christian/Euro-Jewish alliance. Islamic scholarship responded to those Euro-Jewish/Euro-Christian attacks in two different ways, and Maulana was critical of both methods of response. The first was a response that he termed ‘Islamic conservatism’. It represented a Muslim intellectual shut-down against western civilization. All intellectual shutters were closed to modern knowledge that was coming from the west. The justification for that shut-down was that it permitted the construction of an intellectual wall between Muslims and the modern west. That wall was constructed with the belief that such a strategy would protect and preserve Muslims from the greatest danger they had ever faced. But Europe was changing the whole world, including Muslim society, and as Muslim scholars emerged from conservative institutions of Islamic learning, i.e., the Dar al-’Ulum, they were almost always incapable of either understanding or responding correctly to the problems that modern Muslims faced. Such Islamic scholarship eventually became irrelevant to modern Muslims, and such scholars lost esteem and respect from their own modern-educated people. The second response was that of ‘Islamic modernism’, and it went to the other extreme in an attempt to so modernize Islam that it could be accommodated in the modern world. Islamic modernism identified all areas of divergence between Islamic thought and modern Judeo-Christian western thought and then proceeded to brazenly subject Islamic thought to ‘a progressive re-interpretation’ in an effort to reconcile such divergence. Such scholars were eventually transformed internally into intellectual carbon-copies of their western Judeo-Christian masters. Even more lamentably, they were eventually externally transformed as well to imitate western dress – sometimes complete with jacket and tie, while abandoning the clothing that they traditionally wore as Muslims. They even shaved off their beards or reluctantly conceded a brief apology for a beard. In fact the Islamic modernist, male and female, left Islam and were no longer Muslims. Their friendship for and alliance with the Euro-Christian/Euro-Jewish world order resulted in their absorbtion as part of that society. Maulana searched within the Qur’an itself for the response to the challenge of western thought. This required study with an independent enquiring mind that was willing to admit that the Qur’an could yield new knowledge that might have escaped the attention or understanding of previous Islamic scholarship. Then when he located the response in the Qur’an, Maulana then proceeded to use that Qur’anic response as a weapon with which to wage a mighty Jihad against the crusading Euro-Jewish/Euro-Christian west. He himself termed his response as ‘dynamic orthodoxy’. Muslim scholars and leaders who are but carbon-copies of the West are busy trying to modernize Islam so that it can be accommodated in godless way of life of modern western civilization. They create a creature called ‘Islamic Modernism’. Dr. Ansari denounced ‘Islamic Modernism’ and urged Muslims to grasp ‘dynamic orthodoxy’ instead (i.e., that which is firmly based on the Qur’an and Sunnah). ‘The Qur’anic Foundations and Structure of Muslim Society’ is the best modern exposition of that dynamic orthodoxy in Islam. An essentially godless Europe that had conveniently cloaked itself in medieval times in the garb of Christianity, and which subsequently and mysteriously discarded that Christianity for materialism in the modern age, was strangely armed with a scientific and technological power that appeared to be irresistible and indestructible. Europe used that power to take such military and political control of the Muslim world that the Islamic Caliphate was destroyed. Europe then proceeded to render it impossible for Muslims to liberate territory and to establish authentic Islam anywhere on earth. A relentless and merciless European attack on Islamic civilization that has continued uninterrupted even after the destruction of the Caliphate in 1924 has resulted in the subjugation of Muslims to European political control. This control commenced with Europe and then continued with the new Europe in America. Not only is Islamic civilization in a state of political and cultural disarray, but it is also fast approaching a state of total economic enslavement through European Riba disguised as ‘Capitalism’. In the midst of all of this Europe succeeded in ‘liberating’ the Holy Land of Muslim rule and then in restoring the ancient State of Israel. After that, the Israelite Jews were brought back to the Holy Land by European Jews in the strangest and most mysterious ‘return’ of a people history has ever witnessed. Indeed, it has become clear that European control over the whole world was meant to make possible the return of the Israelite Jews to the Holy Land. The fact that Israelite Jews accepted this road back to Jerusalem and interpreted it as an act of fulfillment of a divine promise concerning the return of the golden age and the advent of the Messiah is indicative of their spiritual blindness. They were in fact deceived by the False Messiah (i.e. Dajjal). How should Muslims respond to the drama that is still unfolding? How should Muslims extricate themselves from their present predicament? The answer is that nothing can possibly explain the strange world of today, and nothing can save Muslims from its perils except the Qur’an and the Sunnah of the blessed Prophet (peace and blessings of Allah Most High be upon him). Salvation depends upon the reconstruction of Muslim society as authentically as is possible. Authenticity depends upon fidelity to the Qur’an, and to the one who was sent to teach the Qur’an and to establish its guidance in a concrete model. But the world of Islam may not have to wait for more than a few more decades before that army triumphantly enters Jerusalem and liberates the long-suffering Palestinian people, Christian as well as Muslim, from Euro-Israili oppression. How should Muslims respond to the relentlessly increasing attacks on Islam and on Muslim society these next few decades? How can they survive the next few decades if they cannot establish macro-Islam anywhere since they cannot take control of the State anywhere? The answer is that Muslims must concentrate on establishing micro-Islamic communities wherever they can. If such Muslim communities are to be established on the authentic foundations of the Qur’an and Sunnah, and are to survive the relentless and diabolical attacks of the enemies of Islam, they must strive to implement the entire guidance that emerges from the Qur’an and Sunnah. That guidance has to be extracted, classified and articulated in a manner relevant to the concrete situation facing Muslims today. This is precisely the task that Maulana Dr. Ansari has accomplished in his magnificent work. “The basic purpose and function of this book is to state the Philosophy and the Code of Life as given in the Qur’an. That Code has developed, however, with morality as the central theme. And that should have been so. Because, the value-system which the Holy Qur’an has given establishes spirituality as the root, morality as the trunk, and all other aspects of life: economic, political, etc., as off-shoots of morality, whereby it ensures the emergence of the integrated and progressive individual and the integrated and progressive social order. The central importance for morality that has emerged thus should impress upon the Muslims the central importance of moral struggle. Viewed in that perspective, the present book forms a basic contribution in respect of extricating Muslim society from the Crisis of Character which has overtaken all classes of Muslims, and which is the deadliest poison that has ever paralyzed or killed any human community. The book attempts to respond to the tremendous challenge to the religious way of life in general, and to Islam in particular, which modern European civilization has posed ever since the time of the Crusades. That attack on religion is now culminating with men marrying men, homosexuals ordained as priests and rabbis, and the functional role of gender in society turned upside down. In other words mankind is now experiencing total collapse of the moral foundations of society, and it was for precisely this reason that the author presented so elaborately the moral code of Islam, and took care to argue as convincingly as possible, the rational or philosophical justification for that moral law and code of conduct. He has also articulated the concept of Islamic spirituality with great care and quite some detail and in so doing he has answered critics who had not even emerged at the time that the book was written. But ‘spirituality’ cannot be achieved unless there is a prior moral struggle for the achievement of moral purity. One of the major achievements of this book is its detailed exposition and classification of the Islamic moral code. There is also great value in the beautiful explanation and guidance that it provides of the methodology of Tazkiyah, i.e., moral purification, and of Zikr, i.e., the fragrance which only true love can deliver when it embraces the heart and provokes in the privacy of the heart a constant remembrance of the beloved. At best, the scholastics can function only as formal transmitters of the information they possess, and nothing more. In the end, it is essential to note that no religious leader, not even the Super-Leader, i.e., the Holy Prophet Mohammed (peace be on him), can function in any way as the substitute for God or as a sub-deity: Also, no religious leader, however great, can possess any absolute authority over the Muslims, because absolute authority resides, among human beings, only in the person of the Holy Prophet, who alone is the absolute Leader of the Muslims for all time, and no one else; so that there is no room in Islam for the creation of sects around personalities. The prestige of Islam meanwhile suffers damage after damage and the millet as a whole courts defeat after defeat! “The Qur’anic Fundations and Structure of Muslim Society” constitutes a textbook, workbook, and a veritable manual for survival of Muslims of the present age.